Potter Pinner Meadow belonged to Farmer Wraggs. He carried a hickory stick and had a dog called Tatters. Whilst walking in the Meadow, he would poke among tree roots and slash at the hedges with his hickory stick, while Tatters growled and barked. The frightened animals living on the farm were always getting up Indignation Meetings but could do little stop Farmer Wraggs. 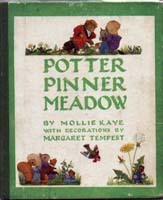 One day Farmer Wraggs’ hickory stick went right through Timothy Tidmarsh’s windows and, to make matters even worse, Tatters had bitten the poor dormouse’s house to pieces. “Something simply must be done” said everybody in Potter Pinner Meadow. And so it was agreed that Timothy Tidmarsh would go to Black Bramble Wood and consult with Old Madam Mole as to what they should do. Back at Potter Pinner Meadow, everyone started to plan how they should drop the magic potion onto Farmer Wraggs and began to wonder what would happen when they did. At last it was decided that Mrs Beatrice Brownwing, the speckled thrush, should fly over him with the bottle in her beak and empty the magic drops over him. While they waited for Farmer Wraggs to come stomping through Potter Pinner Meadow, everyone kept busy helping Timothy Tidmarsh to build a new house. Then one of the young rabbits came dashing down the Meadow crying “He’s coming!”. Mrs Brownwing was off her nest like a rocket and, holding the magic bottle carefully in her beak, circled high above Farmer Wraggs and sprinkled the magic potion over him. All at once he began to shrink and grow smaller and smaller until eventually he turned into a green common-or-garden frog. “Croak, croak, croak” was all he could utter. Presently, Tatters began to bark at his former master. “Down, Tatters, down!” cried Farmer Wraggs but “croak, croak, croak” meant nothing to Tatters who kept on barking and making little rushes at him until the poor farmer became so frightened that he jumped high into the air and landed in a bed of nettles. When Tatters went away, everyone lectured Farmer Wraggs on his Disgraceful Behaviour. They made him spend his day as a frog mending Timothy Tidmarsh’s broken china with fir gum. He was also forced to darn Mr Pricklewig's coats and iron his waistcoats, causing him to burn his fingers on the hot iron. After his ordeal, the Frog Farmer promised that when he became Farmer Wraggs again, he would mend his ways. And that is exactly what he did.